Holy week is upon us. 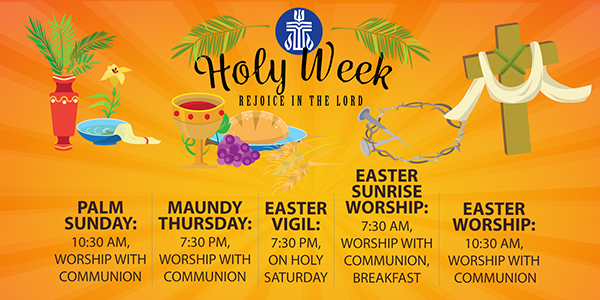 In his week we experience the highs and lows of life, from the entry of Jesus into Jerusalem to shouts of “Hosanna!” to the celebration of the Lord’s Supper on Maundy Thursday that leads into the arrest, trial, and death of Jesus. We keep watch and wait for the promises of Jesus to be made in keeping the Vigil and going to the tomb. Join us in worship, as we experience this week again and anew. 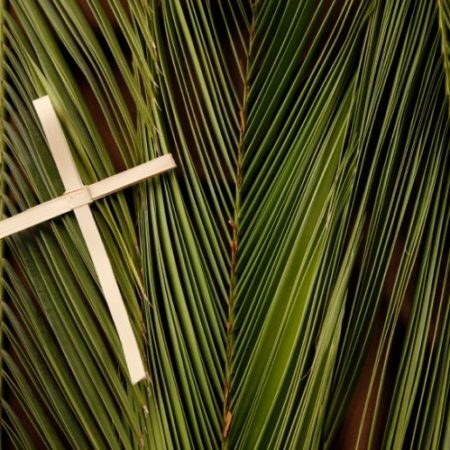 Palm Sunday worship with communion is at 10:30 am on April 14th. We then gather at table in song and communion at 7:30 pm on Maundy Thursday (April 18th). We observe the death of the Christ on Good Friday (April 19th), with a community service at noon, hosted at First Methodist Church. The Great Vigil of Easter is observed on Saturday (April 20th) at 7:30 pm. Early on the first day of the week, we celebrate the Resurrection with a 7:30 am Sunrise service with communion, followed by breakfast, and then we gather again to tell the story of Easter at 10:30 am, also with communion.